It’s so helpful to see ideas from real, live teachers. 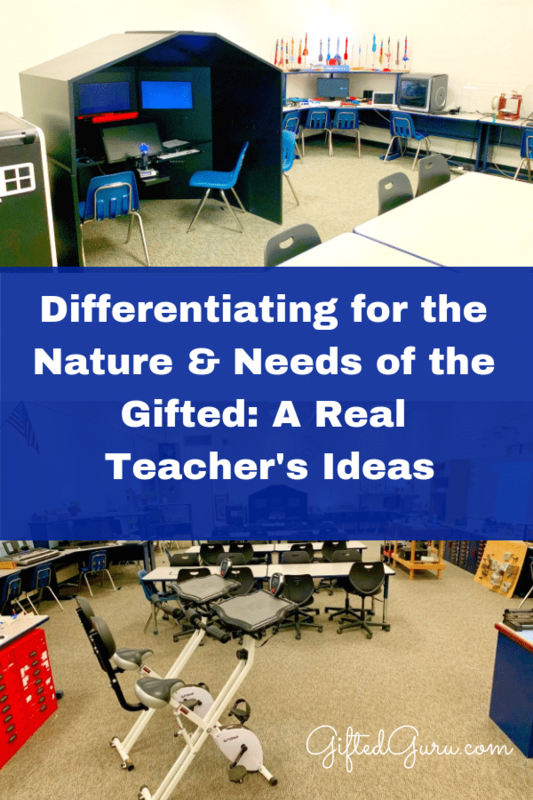 I’m so excited to share these ideas with you for differentiating for the unique nature & needs of gifted students. The teacher I’m highlighting is Susan Day, a teacher at Fairview Middle School in Bremerton, Washington. I think we can all get ideas from what she shares, even if the exact thing wouldn’t work in our classrooms. Note: If you have ideas you’d like to share, please email me or comment below. I’d love to feature the terrific stuff that’s going on in classrooms around the world. I have purchased two classroom bikes that offer two solutions for my gifted kids that experience excitability. 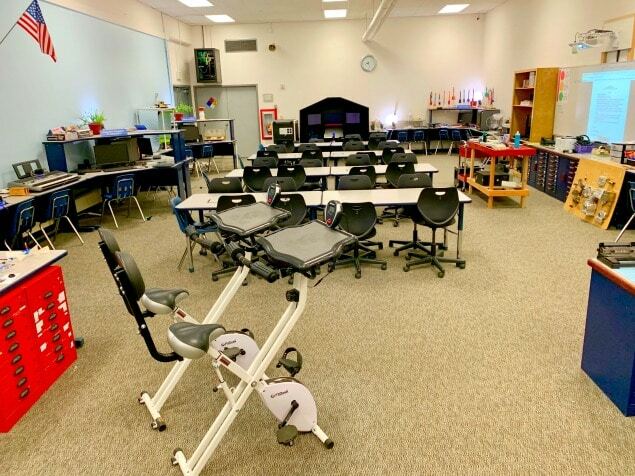 This allows those children a way to continue working on their Chromebook while pedaling to get out some of this energy. It gives the child a focus (for example, ride for 1 mile continuously) while also completing the task at hand. My students were super excited about these bikes. I first had to have sign-up sheets, but funny enough, the kids worked out amongst themselves who “needs” the bike on a certain day and I have never had a fight over them. I love these bikes! Having two is important – they don’t want to be alone on the bike. Lisa’s Note: If you want to check out the FitDesk bikes, you can find them at the FitDesk website, where they have a section called “Fit Student” or on Amazon. Alternatively, those children that need to withdraw also have several spaces they can choose. I built an aviation dome that is three sided and black so it cuts out most of the overhead lighting. 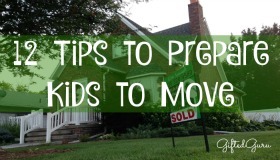 This allows the child to “escape the room” for a bit while still safely staying within the classroom. 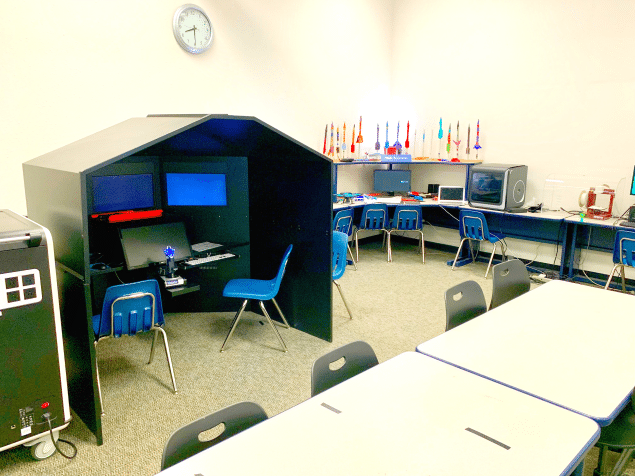 The dome is a cool build, and I do have the occasional kiddo that wants to go sit in it to “get away with something he shouldn’t,” like playing games on a Chromebook. Mostly though, the kids that need to go there to be alone for a bit, do so without fuss and emerge ready to tackle the rest of their day. I think the autonomy I have created with self-selection for the dome helps a lot with fostering a sense of independence. When there are intense moments in my class, I make sure to talk about it thoroughly and gives names to what the kids are feeling. I have noticed that my gifted kids will feel something intensely and not be able to give a name to the feeling or discuss why they are feeling a certain way. By giving these kids the vocabulary to have a conversation about what they are feeling, it has helped immensely to give the kids the confidence to understand that their feelings are valid, even if they don’t know the root cause yet. I have found that the kids that have responded to this have become much less reactive, that the discussion and validation of their feelings was actually what they were looking for in the first place. I set up a lunchtime talk with some of my kids (gifted or not) that just want an open discussion during their lunchtime. I have found that many of my gifted kids don’t understand why people act a certain way and get frustrated when they don’t make “logical” choices. 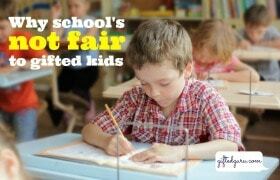 I use this time to tell them my perspective and explain that not everyone is as perceptive of these gifted kids. I have found that these kids are learning to accept others as they are instead of always trying to help – which is resulting in better peer-to-peer relationships overall. I have an after-school club called SkillsUSA that brings in kids from many different social groups. It’s an open-play atmosphere that allows kids time to explore, work individually, in a group, compete with each other, and learn some leadership skills. My highly motivated kids even have the option to take their pursuits to a higher level and compete at local, regional, and state levels! I think unstructured play and building time is important and this club allows for this every week. I am always so surprised at some of the things my kids have come up with! 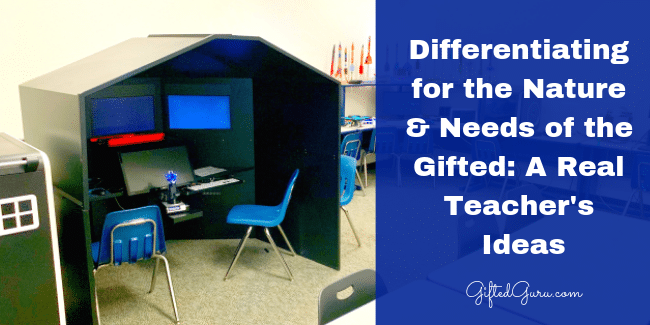 I have several gifted kids in my classes that are often lonely because they feel they have never “connected” with their peers. I seek students out who I think have something in common and put them in groups together to learn from each other. For example, I have an extremely bright female engineering student who has a hard time talking to boys. She desperately wants to talk to boys, but is too shy and does not have confidence. By pairing her with another girl who is not shy, but has incredible social skills, I have watched the engineering child blossom and become more confident through watching the social child interact. It has become a beautiful friendship with these two! And the social child’s grades have gone WAY up too! I love these ideas, and the variety of isses they address. The dome! The dome! I’m in love. What I really appreciate is the way she looked at individual issues and developed targeted responses that ended up meeting the needs of a wide range of learners. Her ideas highlight one of the most critical skills of excellent teaching: creativity in response. When we focus on what we can do with what we can get/what we have, rather than focusing on what we can’t do with what we can’t get/don’t have, great things happen. Again, if you have ideas you’d like to share, email me or comment below. Questions for Susan? Comment below.